A flagship title from the software provider Microgaming, the Immortal Romance online slot is the perfect combination of animated action and potential payouts. Spinning its way through the industry since 2011, this online video slot has stood the test of time thanks to its bonuses and multiple ways to win. 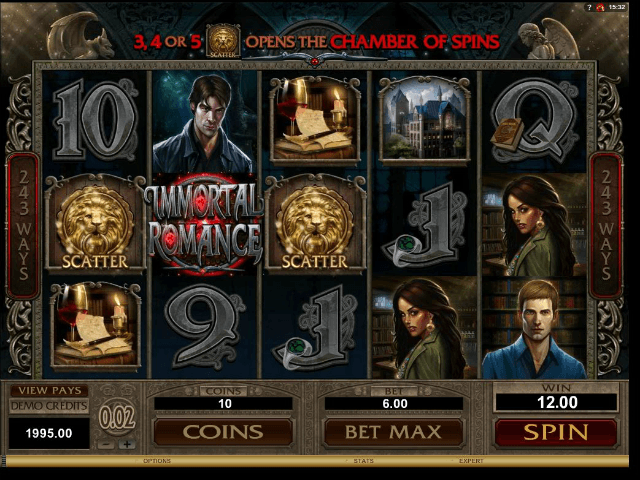 To give you a greater insight into this premier Microgaming title, we've conducted an Immortal Romance slot review. Designed to tease out the finer points of this online slot, our Immortal Romance guide should be all you need to go out and take on the vampires in this moody game! During the Immortal Romance slot game, you'll be twisting and turning through a world filled with moody lighting, vampiric beings and sultry-looking characters. 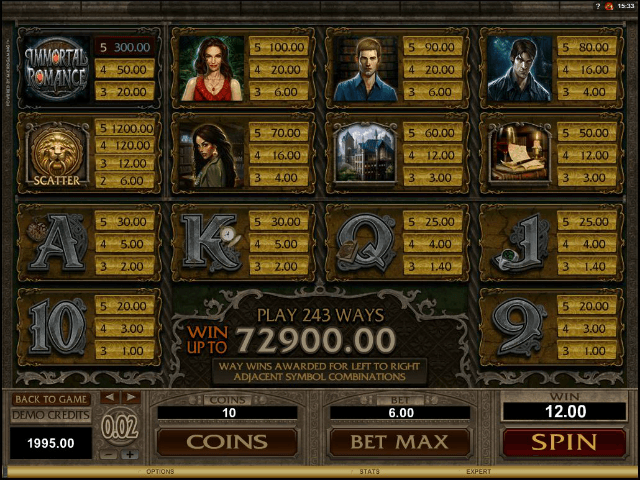 Essentially a cross between Dracula and the Twilight saga, this online slot takes the ever-popular vampire theme and runs with it. 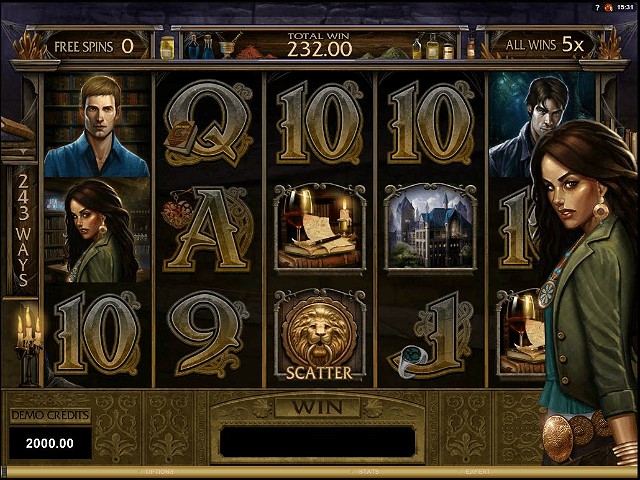 Compared to some of the more modern video slots, Immortal Romance online slot could look a little simple. However, the combination of ominous music, bonuses and jackpots is sure to keep you on your toes. Moreover, you'll discover a game that's as entertaining as it is lucrative. Before we can take you through the Immortal Romance payout table and bonuses, you need to know how to play. 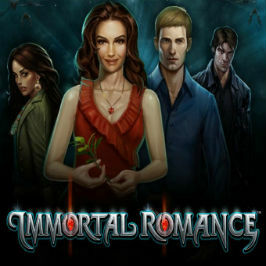 Unlike other Microgaming slots, Immortal Romance doesn't have a fixed number of win lines. Instead, this five-reel video slot uses the 243 ways win set-up which means you can win in virtually any and all directions. In terms of setting your bets, the rules of Immortal Romance dictate that you'll have to choose one of two sizes: 0.01 or 0.02 and then the number of bets you want per spin (from one to ten). Amber Bonus | This opening bonus feature will reward you with ten free spins and a 5X multiplier the first time you enter the Chamber of Spins. 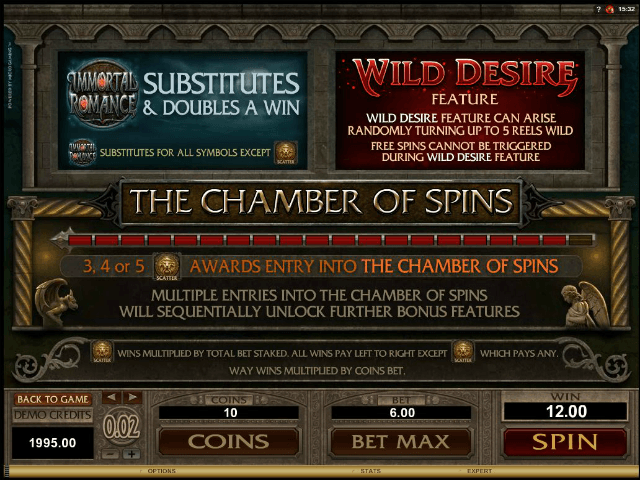 Troy Bonus | Activated on your fifth journey into the Chamber, Troy will give you 15 free spins. Once this bonus round starts, bats will appear at random positions and enhance all wins by turning symbols into 2X and 3X multipliers. Michael Bonus | Kicking into life on your 10th time in the Chamber, this free spins round will give you 20 free turns of the reels. Additionally, any connected symbols will roll together and change to other random symbols as the round progresses. Finally, a 5X multiplier is on hand to help increase your prizes. Sarah Bonus | Opened after the 15th bonus, Sarah's special feature will give you 25 free spins with the wild vine enhancer. Put simply, when the wild vine symbol appears on reel three, it will randomly transform symbols into wilds to give you more ways to win and, therefore, more prizes. Editor's Note: When you combine these Immortal Romance bonuses with a generous 60,000 coin jackpot and plenty of engaging images, it's easy to see why this game is still one of Microgaming's top slots. If you like Immortal Romance - You'll like these slots too!